Emory College first-year students Rostam Zafari, Michelle Skelton, Nick Parker and Mehul Bhagat brainstorm during an Emory Entrepreneurship Ecosystem session. Photo by Tina Chang. A team of budding social entrepreneurs from Emory will advance to the regional finals of the sixth annual Hult Prize Challenge, an international student competition that aims to identify and launch start-up enterprises to tackle broad-based social issues. Sponsored by the Hult Prize Foundation, the competition invites college and university students from around the world to propose ideas to create start-up enterprises that could help solve some of the world’s most pressing challenges. Winners will receive $1 million in start-up funds to help make their ideas reality. This year’s challenge, which was selected by former President Bill Clinton, will focus on creating start-ups that provide sustainable, high quality early education to 10 million children under the age of six, in urban slums and beyond, by 2020. Each of the 253 teams selected for regional competition was chosen from among 20,000 applications from students representing more than 500 colleges and universities located in more than 150 countries. Representing Emory College of Arts and Sciences will be Woodruff Scholar Mehul Bhagat, Atlanta; Rostam Zafari, Atlanta; Michelle Skelton, Tampa, Florida; and Nick Parker, Washington, D.C.
With financial assistance from several departments at Emory, the team — all first-year students — will travel to San Francisco, California, in mid-March to pitch their idea at one of six regional rounds of competition, says Bhagat, who is team leader. Team academic interests span the fields of economics, business strategy and finance, science and medicine. “We’re pleased to have a team with diverse backgrounds and experience that works well together,” Bhagat says. “And we couldn’t be more excited or honored to represent Emory University at this year’s Hult Prize competition,” he adds. Following regional competition, six finalist teams will be tapped to attend the boot camp-style Hult Prize Accelerator this summer to further develop their ideas before attending finals in September, hosted at the Clinton Global Initiative annual meeting in New York. From designing products that make life easier to seeking solutions to combat critical issues such as infectious diseases and educational disparities, Emory University students are interested in creating and launching entrepreneurial endeavors, starting from their first day on campus. Over the past year, Emory has significantly stepped up its efforts to support undergraduate students who are seeking resources and infrastructure to aid their entrepreneurship interests. These efforts were spearheaded by the Committee on Undergraduate Student Entrepreneurship — chaired by Andrea Hershatter, senior associate dean for undergraduate education at Goizueta Business School, and Gray Crouse, professor of biology and member of the academic affairs council for the Office of the Provost. The result was the Emory Entrepreneurship Ecosystem (E3). Committee member Eric Bymaster, associate vice president of finance, administration and operations in Emory’s Division of Campus Life, says E3 was created to coordinate resources and provide better support for students interested in entrepreneurship, including not only traditional for-profit ventures but also social entrepreneurship. 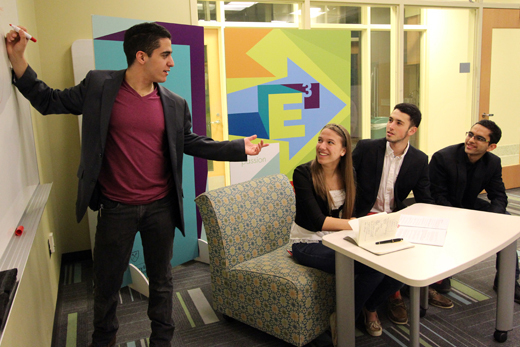 This semester, Campus Life launched the E3 Living Labs, a communal space in Few Hall where like-minded student entrepreneurs can take advantage of networking opportunities and develop and implement their own ideas. Every Tuesday evening at 7 p.m., students can listen to entrepreneurial topic presentations by guest speakers — including an inaugural talk by Emory faculty entrepreneurs Dennis Liotta and Charlie Goetz — and engage in question and answer sessions with those who have entrepreneurial experience. On Wednesdays and Thursdays, the Multimedia Den in Few Hall is reserved for peer-to-peer networking from 6-9 p.m.
“Spring semester has been our pilot for the program to see how everything goes, but we hope to create an ongoing series every semester that brings in faculty, alumni and graduate students with entrepreneurial experience who can serve as mentors for students,” Bymaster says. Emory College senior and student entrepreneur Kaeya Majmundar, who last year appeared on the popular television show "Shark Tank" and who also served on the Student Entrepreneurship Committee, says the program expands the number of resources available to student entrepreneurs. Emory College freshmen and Raoul Hall residents Rostam Zafari and Brian Goldstone were inspired by a classroom challenge to try to develop Rapid Ebola Detection Strips (REDS), a portable, less expensive approach to detecting the Ebola virus in the field. Zafari has been active in planning, participating in, and promoting the Living Labs as well as collaborating with other student entrepreneurship groups, such as Emory Entrepreneurship and Venture Management (eevm), Emory’s campus-wide entrepreneurship and venture management student organization. Andrea Hershatter, who is director of the BBA program and teaches entrepreneurship at Goizueta, worked with Senior Vice President and Dean of Campus Life Ajay Nair to form the committee that developed the strategic plan around entrepreneurship and the formation of E3. “Over the years, I have worked mostly with undergrad business students, but I also encountered many college students who were trying to bring their ideas to fruition and were seeking guidance and support. While the university embraces venture-creation, and many students have found mentors amongst the faculty, there has not been an organized or sufficient set of entrepreneurial resources at Emory thus far,“ Hershatter says. She credits Nair for helping fuel the increase in support for student entrepreneurs. “Early in Dean Nair’s tenure at Emory, I was working with the student team that was in the process of launching the Emory Bubble. When they approached him, he was incredibly crucial in connecting them with the resources and visibility they needed to bring the Bubble to Emory. I saw that as a signal of strong university momentum and believe that Dean Nair’s enthusiastic support has been the needed catalyst in making significant moves to support entrepreneurial interest on campus,” Hershatter says. Under the E3 umbrella, Goizueta will hold the first Emory Entrepreneurship Summit on April 10-11. The event will feature keynote speaker Mike Dubin 01C, CEO of Dollar Shave Club, and a fireside chat hosted by Barry Silbert 98B, founder of Digital Currency Group, Bitcoin Investment Trust, and SecondMarket. “Events like this are starting to signal to the world that we mean what we say about supporting entrepreneurship and moving Emory forward in this space,” Hershatter says.